Clients who build a custom home expect it to be energy- and resource-efficient. Not everyone wants to live off the grid, but they do want lower energy bills, and if solar photovoltaic (PV) systems can help them get there, so much the better. In addition to PV systems, the two homes profiled in this article utilize proven sustainable design and building practices such as passive solar, high-performance windows, advanced air sealing, geothermal heating, and a robust amount of insulation. In both cases, it was more important to the clients to build homes they could live in for the long term than to qualify for green certification. Bost’s clients had been living in a 15-year-old Colonial and wanted to retire in the Chapel Hill area. They purchased a 1-acre, wooded lot with the idea of building a home that would be modern, durable, low-maintenance, and extremely energy efficient. They approached Bost with a Prairie-style plan by Barclay Home Design, in Clackamas, Ore., and the builder collaborated with Barclay and the clients to adapt the plan to the site. Bost’s standard practices include advanced air sealing, 2-by-6 framing, a full spray-foam insulation package, an aligned air barrier, conditioned attics, and conditioned mechanical rooms. All lighting is LED. 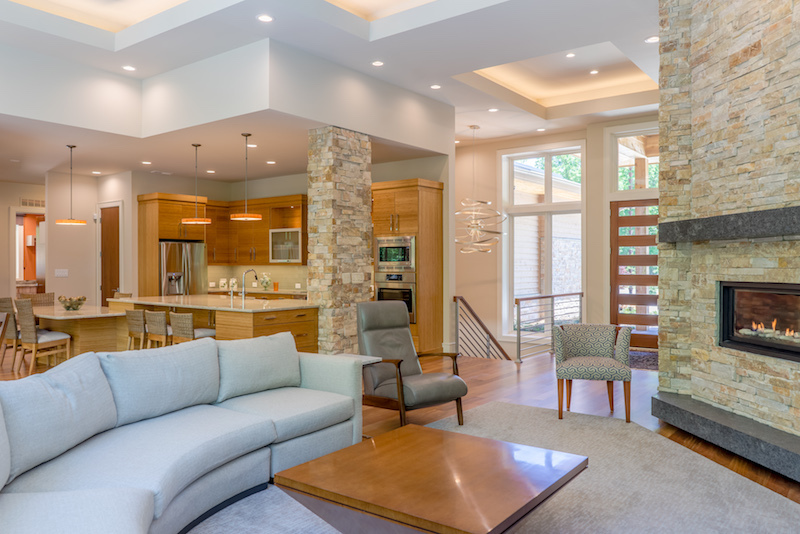 The clients opted for two geothermal heat pumps to condition the bedrooms and main living areas separately; these systems leverage the 50-to-60-degree temperature deep underground to help cool the home in the summer and heat it in the winter. The home’s low-pitched roof enables the 6.1 kilowatt monocrystalline solar array to be extremely efficient. “Luckily, there are no covenants in that neighborhood prohibiting solar panels on the front of the house, where they’re visible from the street,” Bost says. The impact on the clients’ utility bills has been significant. In March, their bill was approximately $63, Bost says. Aesthetically pleasing touches include a translucent onyx sink in the power room that glows when the lights are off. The walls of the powder room are covered in a thin layer of cork. 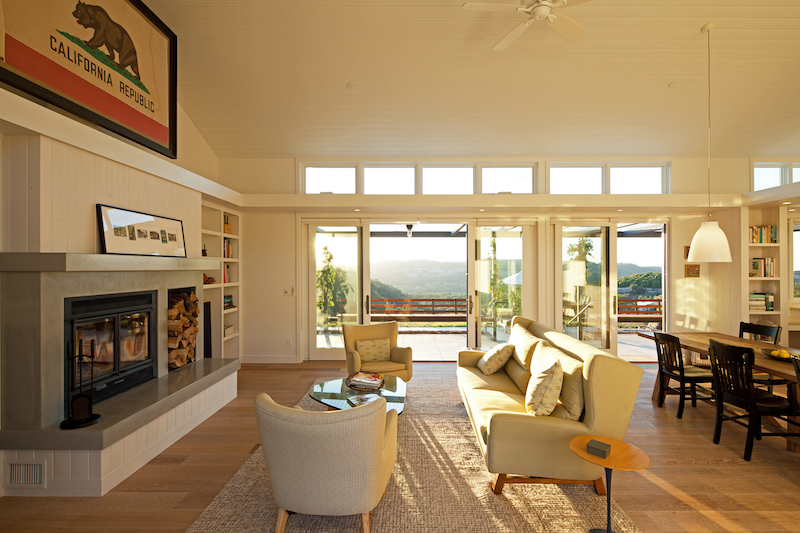 Semmes & Co. Builders and Gast Architects, of San Francisco, turned a 3-acre lot along California’s Central Coast into an energy-efficient residence for retirees from Los Angeles. In this development near Arroyo Grande, houses are clustered so that only a small portion of the site is occupied by buildings, leaving a large amount of open space. Ranch grasslands and oak woodlands are preserved for wildlife. “The houses are visible to one another, but the lots are large enough so that the owners have a good degree of privacy,” architect David Gast says. The property slopes steeply down from the access road to a more level site. “We wanted to do a single-story house that would open on multiple sides to encourage indoor-outdoor flow,” Gast says. Putting the 3,277-square-foot house on the lower part of the site allowed Gast to accommodate fire-truck turnaround requirements and offered the home more privacy from neighboring houses above it, also enabling a stronger relationship to the oak woodlands to the south. He oriented the house so that “the grand pavilion” of living room, dining room, and kitchen face west, capturing the best views. “We wanted to bring light in from both sides of the house in the morning as well as later in the day,” he says. To mitigate the western exposure, Steely says, “We used solid roof overhangs and trellis-wire overhangs planted with wisteria vines. This helps block the summer sun and allow in the winter sun.” Deciduous trees, once they mature, will shelter the home from summer sun. In winter, they’ll lose their leaves and allow more sun into the house. For optimum sun exposure, the pool was also placed on the west side. Toward the east, on the uphill side, is a patio sheltered from winds and adjacent to the kitchen to facilitate barbecuing. The patio has raised planters for easier gardening. Steely says that no air conditioning is needed due to the tight building enclosure, high insulation values, low-E2 glazed windows and doors, ceiling fans, whole-house exhaust fan and cross-ventilation. The 4.41 kilowatt rooftop solar array is expected to cover approximately 77 percent of the clients’ annual electrical needs. Solar hot-water collectors heat the pool. “Mass—in terms of 5⁄8-inch drywall throughout, a high-density wood floor, precast concrete, stone countertops, and tile wherever possible—helps buffer the climate to maintain a comfortable temperature in the home without mechanical intervention almost all year,” Steely says. The home also has a high-efficiency furnace and water heater. Gast designed the home to look like a cluster of pavilions. He describes it as a contemporary farmhouse with modernist agrarian elements, picking up on gabled roof forms and some of the materials typically used on farmhouses and farm buildings, such as wire and metal roofing. 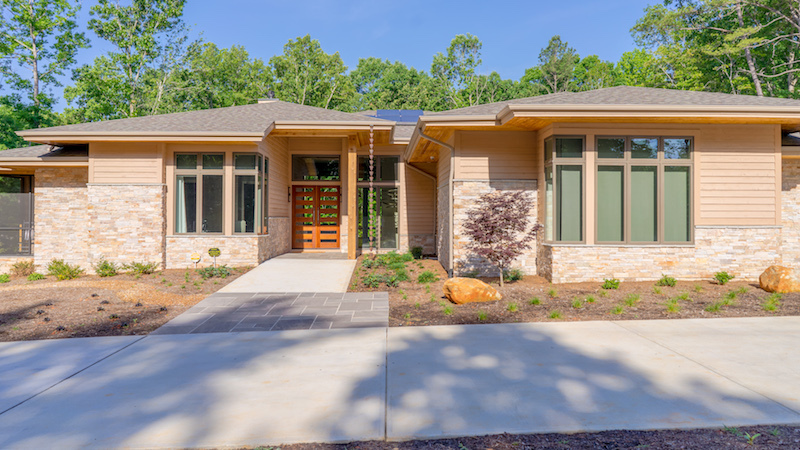 Bost Custom Homes, of Cary, N.C., builds at a price point where solar is always part of the discussion with clients. Evan Bost, director of marketing and building performance, recommends that all clients conduct a solar analysis “so they have the information to make that decision.” There are currently no other incentives for renewable energy in North Carolina, but homeowners can take advantage of the 30 percent federal tax credit. Semmes & Co. Builders, in Atascadero, Calif., also has the solar conversation with every client. “If they’re not interested at the time, we make sure there’s conduit from the most likely installation location and room on the panel to connect,” says Jessica Steely, president. 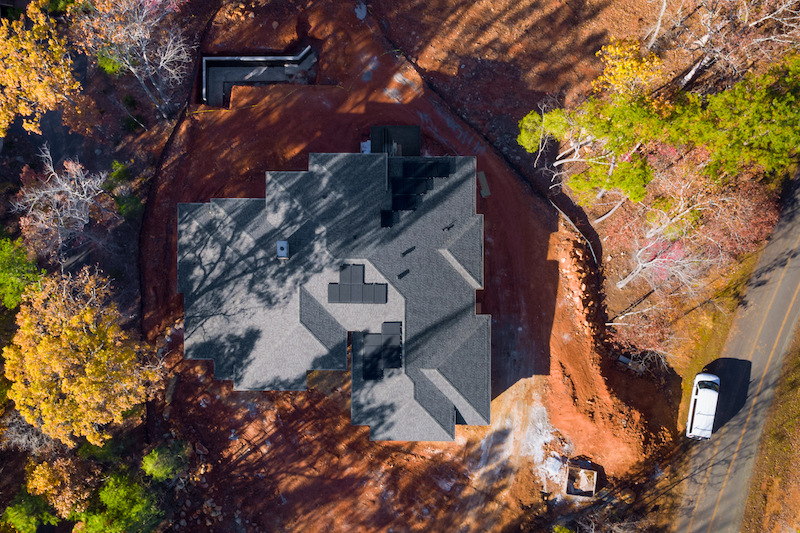 For the featured home in Chapel Hill, N.C., Graham Alexander, senior residential energy specialist at Southern Energy Management, in Morrisville, N.C., determined preliminary placement of the solar panels once the lot had been cleared and the house staked out. Final placement was determined after framing, based on an analysis that indicated the optimal locations for the panels to maximize solar exposure, given the exact orientation and tree shading. During construction, Southern Energy Management evaluates a home’s potential energy use based on appliance specs and building techniques. Southern Energy’s Building Science group performs the ratings and testing. “Having the modeling for the home allows me to accurately [calculate] the monthly usage before it’s completed,” Alexander says. The home must also comply with National Electrical Code setback requirements for fire safety, which may differ depending on the local jurisdiction (3 feet is typical). Comments on: "Custom Homes Lead The Way In Sustainability"